Rustic Canyon Hole 1: Great opening golf hole with a immensely wide fairway for an opening tee shot. This par 5 is short enough that the good drive allows the player the option to go for the green in two. This green, while enormous, is undulating, and a ditch / bunker runs from the front and wraps around the right side of the green. The lay-up, if played left of the ditch, makes the angle to most pin placements on the green much easier. If played right, it’s safer, but the approach is more difficult, at least for front pins. Rustic Canyon Hole 3: Another good decision hole, at only 319 yards, this hole tempts the player to go for the green from the tee. However, there is a waste area in the middle of the fairway with two large bunkers that must be carried. Additionally, there are more bunkers and OB left that will nab anything pulled. The lay-up drive out to the right has no danger, but leaves a slightly more difficult approach shot to a green that is shallow from that angle. Rustic Canyon Hole 4: The first of three good par threes on the front nine features a cross bunker that makes the front half and right portions of the putting surface blind. However, it is well short of the green and the real dangers are the bunkers left and long. Like so many greens at Rustic, a hump is in the middle which makes putting the tee shot on the correct quadrant essential to avoid very difficult putting situations. Rustic Canyon Hole 5: The most treacherous par 5 on the course features a relatively tight drive for Rustic followed by a section shot that must clear the dry creek bed and avoid bunkers right, hazard left and pot bunkers in the middle. The green complex is dominated by the severe drop off left of the green that will render any thing that goes there a near impossible up and down. Rustic Canyon Hole 6: This is a brutal and challenging one shot hole. At over 200 yards, a long iron or fairway wood must be hit in order to reach the green. The green however is fronted by a natural swale that will stop any shots hit short from running up, unless the shot catches the down-slope into the swale, which isn’t a real high percentage shot. The bail out to the right leaves a difficult downhill chip or bunker shot to a green that runs away from the player. A big breaking green makes putting tough as well. Rustic Canyon Hole 8: A tiny par 3 with an unbelievably small, difficult and tiered green. The shot is short enough where the green shouldn’t be missed, but if it is, the chances of par drop significantly. The green is perched a top a hill so all chips or bunker shots are steeply uphill and difficult to get close. Rustic Canyon Hole 10: This long par five has a drive with hazard down the right and a pot bunker in the fairway. The challenge, however, is really the second shot as there are a series of cross bunkers to go over. Any shot that stays right and close to the bunkers on that side gives a much better angle to the green, and usually a shorter shot as the hole bends right. The green itself is skinny and 50 yards deep, so there can be some long putts. Rustic Canyon Hole 11: This is the first of four difficult par fours on the back nine at Rustic (14, 16 and 18 are the others). The drive must not go left into the hazard, but the farther right one goes, the longer the approach on this dogleg left. The green is wide and has a tier separating the left half from the right, making long putts tough. Large bunkers left and short right make this approach quite fearsome, but more some from a long distance away. Rustic Canyon Hole 13: Possibly the most serene views on the course are presented to the golfer on this uphill par five that ventures as far back into the canyon as the property allows. The main feature on the drive is the pot bunker dead center of the fairway, but OB rights is a worse option. The green wraps around a deep bunker in its front center and has many sections that can leave awkward pitches or putts. Rustic Canyon Hole 14: One of the most difficult par 4’s a golfer will face, from tee to green. A big dogleg left where the tee shot must carry at least 200 yards over hazard to a fairway running almost perpendicular to the golfer. The farther left the drive, the longer the carry, but the golfer is rewarded with a shorter approach. This approach is downhill to a wide open and expansive, sweeping green, where left is dead. Rustic Canyon Hole 16: A serene view greets the golfer at the elevated tee of this natural looking and sweeping downhill hole. Any pulled drive is down into the hazard, but the straight shot will be rewarded with another downhill shot to a shallow green where distance control is tough, and anything too long goes down a steep hill. Rustic Canyon Hole 17: This downhill par three is only slightly so, but there is a view down the valley. The main trouble is the bunker / waste area short and right, which must be avoided. However, going left, while safe, almost always leaves a very fast chip or putt down the hill. 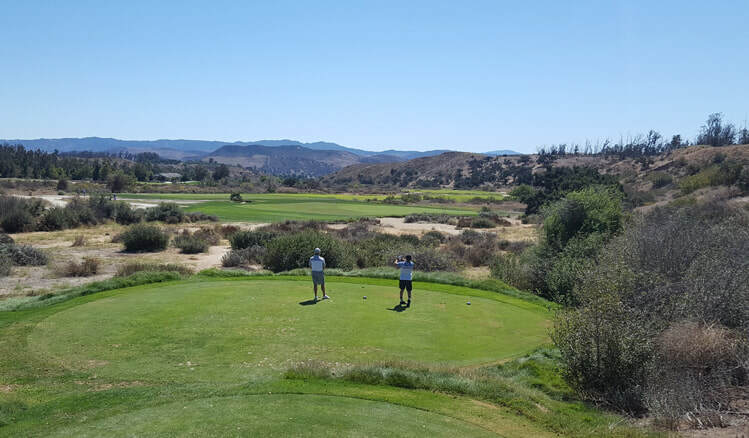 or try Tierra Rejada Golf Club Review, another Top Ventura County Golf Course.